A stained glass window commemorates those who died in service or were killed in action during World War One. At a well attended meeting of the parishioners of St. Stephen's Church, Wynyard, on Thursday evening, it was unanimously decided to call for tenders for a new church at Wynyard, and to at once proceed with its erection. The foundation stone will be laid on June 18. Various sub-committees were appointed to make the necessary arrangements. 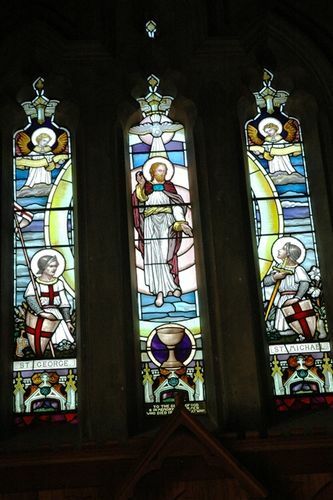 It is proposed to provide an East window in the new church in memory of our fallen soldiers. In the centre will be a representation of the Light of the World, with representations of St. Peter and St. John on either side, the scheme to be carried out in stained glass at a cost of about £100. At the foot a suitable inscription will be placed. Advocate (Burnie), 3rd May 1919.